In order for scaffolding rentals to be safe and secure, it relies on components like the Scaffold System rosette connector. This makes for a quick and efficient system, meaning you can spend more time getting work done and less on setup and breakdown time. Feel free to continue reading if you’d like a closer look at the rosette connector. The Scaffold System is a type of scaffold that uses the rosette connector to make building and disassembling simple. A trained professional can even use this system with just a hammer and a wedge. The wedge head connects to the rosette, and a wedge is hammered into it. This system is quick and easy, and the minimal amount of building parts helps you stay safe. No matter what kind of renovation or event your company has planned, a rosette connector may be a part of the scaffolding system. Scaffold Resource is a construction scaffold rental company that specializes in both scaffolding and shoring near Washington, D.C. If you would like any more information on the rosette connector as well as help with any of your business’s scaffolding needs, please visit our website or call our scaffolding experts at (301) 924-7223. As long as they are used properly, scaffolding rentals can be extremely helpful for your business’s next project. Anyone who uses scaffolding should be trained, experienced, and familiar with the appropriate safety regulations. Watch this video on the essential guidelines to follow. It is essential for everyone’s safety that only fully trained professionals use the scaffolding. A supervisor or other competent worker should ensure that the base is stable and that the load capacity is adhered to during the job. Anyone who works on a scaffold should wear footwear with traction as well as head and fall protection. Since there may be minimal space on the platform, keep your tools organized and accessible. At Scaffold Resource, we are happy to provide scaffold rentals in Washington, D.C. We can help you find the right construction scaffolding for your commercial project so you can enjoy the results you want. Call us at (301) 924-7223 for more information. 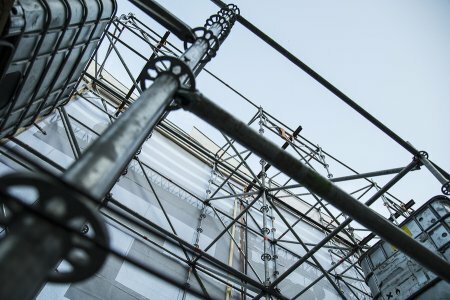 Falling objects can quickly lead to serious injuries and damaged property, so you should do what you can to minimize the risks when working on shoring scaffolding rentals. Make sure your work area is clean and organized, loads are secure when you move them, and that you wear footwear with extra traction. Here’s a look at reducing the risk of falling objects. When you’re up on your scaffolding rental, you might not have a ton of room to move around. This is even more of a concern if there are multiple people working on one platform. In order to prevent objects from falling to the ground below, be sure to keep your workspace clean and organized. This way you won’t accidentally kick anything to the ground or trip over tools that are lying on the platform. Use a tool belt and keep your area organized to prevent accidents. 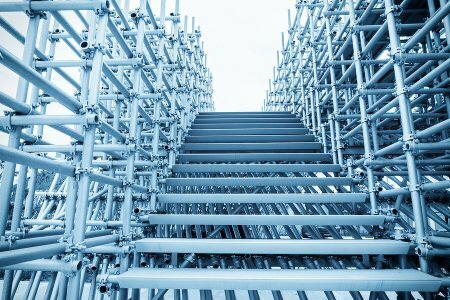 Scaffolding can be used to lift people and tools up off of the ground with an elevated platform, and this can also help you transport loads. When transporting any kind of load, make sure you do so safely and securely. This means never lifting a load over someone’s head, and only moving a load when you have a spotter who can help. Moving loads securely can reduce your risk of falling objects. The right safety gear can protect you from falling objects, but it can also minimize the risk. It’s important that you have enough traction when you’re working up on a scaffold. Footwear that doesn’t offer enough grip may cause you to slip, fall, or otherwise lose your balance and drop something off of the scaffolding. Sturdy gloves can also improve your grip on your tools, making it less likely that they will fall down below. 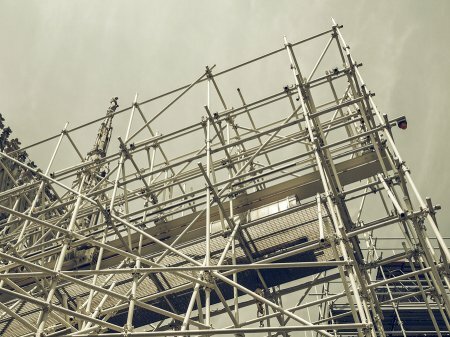 The right scaffolding or shoring system near Washington, D.C. can make it much easier to keep objects from falling down and creating damage or injury. Feel free to call Scaffold Resource at (301) 924-7223 or visit our website for details about our work platforms . Not all shoring systems are the same, and you’ve got several options to choose from. Think about how many workers will be involved, how much financial room you have for the task, and consider the nature of the job at hand. Take a look ahead to find out how to choose an appropriate shoring system. Only trained and experienced crewmembers should be using the shoring system, so think about the conditions with which they are most familiar. Talk to your crew about what types of shoring they are most familiar with and choose the system that makes members comfortable. Contractors who are accustomed to one particular type of shoring system may not be excited about the idea of switching to a different one, which can impact the overall morale of your crew. Always keep the needs and comfort of your crew in mind when choosing a shoring system. Once you start to formulate an idea of what kind of shoring system might be appropriate for your project, you’ll need to look at your budget. If you want a high-quality shoring system for the best price, you can typically save money by talking to a scaffolding rental company. A rental company will give you access to the best equipment without the price of ownership. Different types of shoring tend to be better suited for different types of jobs, so you should be able to recognize which option is best for the task at hand. Think about how deeply you’ll be excavating, the location of the project and how much room you have to work with, and even the structural stability of the soil. These are all important elements to include when choosing shoring, but you still must think about your crew and your budget. When it comes to choosing an appropriate shoring system near Washington, D.C., you will want to work with trusted professionals . You can contact Scaffold Resource or visit our website to learn about our work platforms. Call us at (301) 924-7223 to learn more about our scaffold and shoring services.